“alert” Base alert class, used to add border, margin and bottom to other alert classes. “alert alert-primary” Used to create an alert with primary color. “alert alert-secondary” Used to create an alert with secondary. 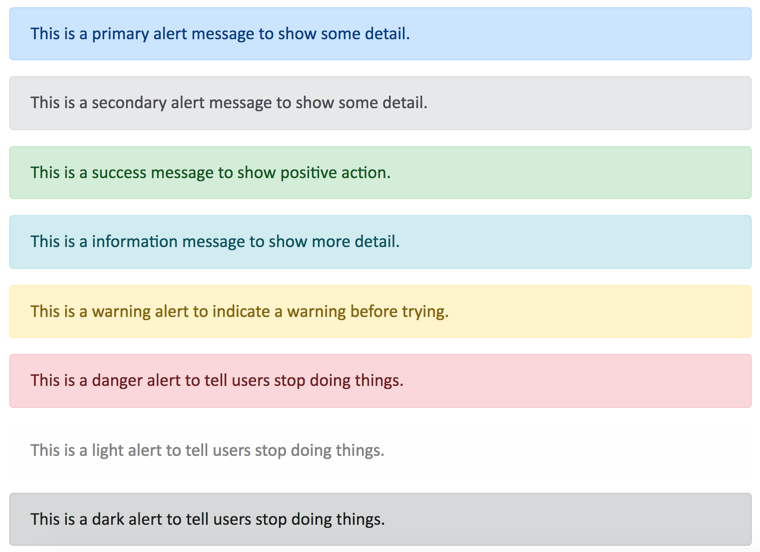 “alert alert-success” Used to create an alert with light green to indicate a positive action. “alert alert-info” Information message in skyblue color. “alert alert-danger” Message for danger, stop or negative actions. “alert alert-warning” Indicative warning message. “alert alert-light” Indicative lighter message. “alert alert-dark” Indicative darker message. The highlighted four types are added newly in the latest version 4. Below is how the alert messages will look like. The alert classes can be used with any of the HTML block element, in our example let us use with <div> tag. And the code for the alert messages is given below. For simple alerts, you don’t need to include script files. This is a primary alert message to show some detail. This is a secondary alert message to show some detail. This is a success message to show positive action. This is a information message to show more detail. This is a warning alert to indicate a warning before trying. This is a danger alert to tell users stop doing things. This is a light alert to tell users stop doing things. This is a dark alert to tell users stop doing things. You can use most of the HTML elements within alert boxes. There are dedicated classes for heading and links. Default HTML elements can be used for paragraph and other typography. Let us create a paragraph with heading and a sample image inside the success alert box. The hyperlinks may create problems with visibility as the link color may not sync with the alert box color. 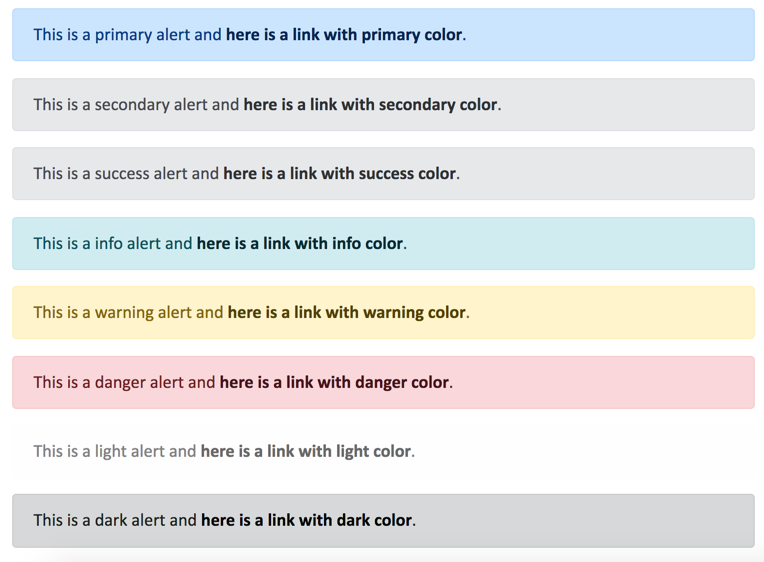 Bootstrap solves this problem by providing a utility class “alert-link” to inherit the link color from the alert color. This is a primary alert and <a href="#" class="alert-link">here is a link with primary color</a>. This is a secondary alert and <a href="#" class="alert-link">here is a link with secondary color</a>. This is a success alert and <a href="#" class="alert-link">here is a link with success color</a>. This is a info alert and <a href="#" class="alert-link">here is a link with info color</a>. This is a warning alert and <a href="#" class="alert-link">here is a link with warning color</a>. This is a danger alert and <a href="#" class="alert-link">here is a link with danger color</a>. This is a light alert and <a href="#" class="alert-link">here is a link with light color</a>. This is a dark alert and <a href="#" class="alert-link">here is a link with dark color</a>. Below is a warning alert with a close button, once clicked on the “X” button the alert will disappear and the below content will move up to show the content in an appealing manner without large gap. Click on the "x" button on the right to close this alert box. The close mar “X” is basically a button with “.close” class. This is to ensure the visual look is aligned properly on all devices. “&times;” is the HTML escape entity which will be rendered as “X” button on the browser. The “aria-label=”close” attribute is used to improve the accessibility for screen readers to indicate a close button. The class “.alert-dismissible” is used to create the required padding the right of the close button. Classes “.fade” and “.show” are used to create animation effects. close.bs.alert This is triggered immediately when the close button is clicked. closed.bs.alert This is triggered when the alert is closed. Below is the code for creating alert when clicked on the close button. Similarly you can use “closed.bs.alert” event to trigger a popup alert when the alert is closed. Glyphicons are not supported in Bootstrap 4, but you use font awesome icons or any other SVG icons along with alerts. Check out separate article on how to use font awesome icons with alerts and below is the live demo. This is the info box - You can input as much or as little information! This is the help box - You can input as much or as little information! This is the tip box - You can input as much or as little information! This is the notice box - You can input as much or as little information! This is the success box - You can input as much or as little information! This is the danger box - You can input as much or as little information! This is the warning box - You can input as much or as little information! Hosting font icons on your own site might be a troublesome task. In such a case, instead of font icons you can use small images in front of the alert components like below. This is an information alert - You can input as much or as little information! This is an warning alert - You can input as much or as little information! This is an rejection alert - You can input as much or as little information! This is an acceptance alert - You can input as much or as little information!